Saints have announced that four players will be making the step up to the Senior Academy ahead of next season. Will Allman, Alex Moon, George Furbank and Tim Cardall have all signed full-time contracts at Franklin’s Gardens. And Saints director of rugby Jim Mallinder predicts bright futures for the quartet. “The hard work of the club’s Academy coaches - as well as the conditioning team and physios - along with support from the players’ parents is ensuring that we have a steady stream of very good young players coming through the system and into the full-time ranks,” Mallinder said. “As much as we would like to offer a contract to everyone we’re not in a position to do so, and those players who do get offered one have earned their opportunity. Allman, who has played in all six of England Under-18s’ games in 2015, is a flanker, whose grandfather, John, captained Sale in the 1960s. 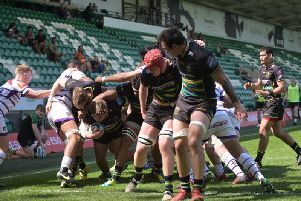 Moon, a lock, is also an England Under-18 international, while full-back Furbank was a key figure in helping Saints win the 2014 Academies League title. Lock Cardall is a Moulton College pupil and was part of the Saints sevens squad which qualified for last year’s Premiership Rugby Sevens Finals.